Dietary fiber is a type of carbohydrate that is not digested in the human gut. It can be found naturally in whole plant foods (intrinsic or intact), but it can also be isolated or synthesized and added to manufactured foods (functional fiber). The fiber contained in manufactured yogurt (inulin) is an example of a functional fiber. To meet your dietary fiber requirement, include three or more servings of whole grains, and five or more servings of vegetables and fruits. Pick whole foods, not juice to meet your requirement. 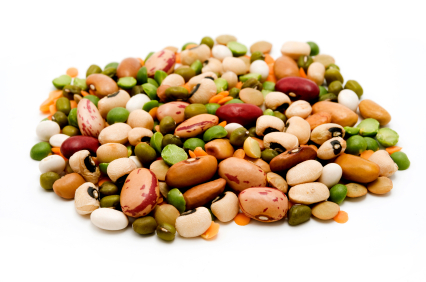 Legumes (dried beans and peas) are a great source of fiber at 7 grams per 1/2 cup of cooked food. Legumes are also high in protein, vitamins and minerals. Unprocessed starchy vegetables (with their skin on) are also good sources of fiber at about 3 grams per 1/2 cup of cooked food. Most whole fruits contain about 3 grams of fiber per medium-sized fruit. Berries provide anywhere from 3 – 8 grams of fiber per cup. A small banana provides about 3 grams of fiber for 90 calories. Meeting your dietary fiber requirement by consuming whole foods (i.e. whole grains, vegetables, and fruit) is the best tactic since it maximizes intake of vitamins, minerals, and phytochemicals (e.g. antioxidants) while minimizing intake of sodium and calories. If you are unable to meet your dietary fiber requirement from whole foods due to medical or other reasons, then use of functional fibers (e.g. fiber added to yogurt or laxatives) as a supplemental source can be beneficial. These products can also be helpful as a step towards increasing dietary fiber gradually while one makes multiple dietary changes simultaneously. MyNetDiary Tip: You can select fiber as one of your nutrients to track so that it will be displayed on your daily intake screen as well as on reports. Simply go to the PLAN section on the web to select fiber for tracking. Meal Planning & Diets/Healthy Eating Nutrients/"Carbs: Fiber, Starch, & Sugar"